Beta-glucans, which existed in the cell walls of cereals, bacteria, and fungi, comprise a group of β-d-glucose polysaccharides. We investigated the effects of four kinds of beta-glucan, that are derived from barley, yeast, mushroom, and euglena on wound healing. The migration and viability of keratinocyte or fibroblast were analyzed using the in vitro scratch wound healing assay, invasion assay, MTT assay, and in vivo assay. All the beta-glucans had a significant effect on keratinocyte migration at 20 μM and showed no toxicity on dermal fibroblast. Moreover, treatment of keratinocytes with the beta-glucan derived from the mushroom (Schizophyllum commune) promoted in vivo wound closure. The Integrin/FAK/Src pathway is known to affect cell migration by forming lamellipodia. Beta-glucan from S. commune activates the Integrin/FAK/Src signaling pathway in a time-dependent. Reactive oxygen species are associated with fibroblast differentiation to contract dermal layer and synthesize collagens. We found that fibroblast was activated by increasing NOX4 expression. We propose that beta-glucan derived from mushroom is capable of promoting keratinocyte migration via the induction of FAK/Src phosphorylation there by accelerating wound closure and activating dermal fibroblast differentiation through NADPH oxidase for matrix remodeling. Beta-glucan is a generic term for β-d-glucose polysaccharides, a major component of the cell walls, and classified into microbial- or plant derived-glucans depending on sources such as, bacteria, fungus, yeast, cereal [1, 2]. In general, beta-glucans have d-glucose units with β-1,3 link, but cereal beta-glucan contain both β-1,3 and β-1,4 backbone bonds. Yeast and fungus β-glucan contains long β-1,6 and short β-1,6 branching respectively, while bacterial beta-glucan have no branching  (Fig. 1). Also, different types of beta-glucans exhibit distinct molecular weights, solubility, and viscosity causing diverse physiological functions . It is well known that beta-glucans modulate immune functions such as phagocytosis, have anti-cancer and anti-biotic properties, and lower blood pressure or cholesterol levels . Since beta-glucan also induces the production of growth factors essential for skin, promotes collagen biosynthesis, and maintains skin’s moisture and elasticity, we investigated whether beta-glucan regenerates damaged skin and different types of beta-glucan have different effects. Regeneration of impaired skin involves complex biological processes, such as re-epithelialization and fibroplasia. During re-epithelialization, epithelial cells surrounding wound margin grow and migrate to form normal epidermis before they start to differentiate for stratification giving rise to the basal, spinous, granular, and cornified layers. Integrin-induced FAK/Src signaling pathway was shown to regulate epithelial cell migration . For fibroplasia, it is essential that dermal fibroblast proliferates and differentiates. Differentiated dermal fibroblast synthesizes extracellular matrix, such as a collagen and elastin, and induce dermal contraction . In this study, we show that four types of beta-glucan promote epithelial migration and dermal activation without any toxic effects on the skin cells. In particular, beta-glucan derived from S. commune was most effective in wound repair. It accelerated re-epithelialization through integrin/FAK/Src signaling pathway and activated dermal transformation via integrin or reactive oxygen species (ROS) production. Beta-glucan derived from black yeast, barley, and euglena gracilis were respectively purchased from TCI chemicals (G0331), SIGMA (G6513), and SIGMA (89862). Beta-glucan derived from S. commune was obtained from QUEGEN biotech. These were dissolved in distilled water and adjusted to pH 7.0. Human dermal fibroblasts were isolated from human foreskin specimens in this lab, and described in previous paper . Human spontaneously immortalized keratinocyte cell lines (HaCaT) were obtained from the Korea Cell Line Bank. HaCaT keratinocyte and primary human dermal fibroblast were cultured in DMEM (Gibco Co.) supplemented with 10% FBS (Omega Co.) and 1% penicillin/streptomycin. Cells were incubated at 37 °C in 5% CO2. Cells (2 × 104 cells/ml) were seeded in 96-well plates. Next day, cells were treated with four types of beta-glucans (0–40 μg/ml) or S. commune-derived glucan (0–0.4 mg/ml). After incubation for 24 or 48 h with HaCaT or fibroblast, 10 μl of MTT solution (5 mg/ml) was added to each well, and cells were incubated for an additional 4 h at 37 °C. The medium was replaced with 150 μl DMSO, and the plate was incubated for 30 min at room temperature with shaking. Absorbance was measured at 570 nm using a spectrophotometer . HaCaT cells were incubated in 48-well plates at a density of 7 × 104 cells/well for 24 h. A scratch was made on the cell monolayer by drawing a pipette tip across the well. The culture medium was supplemented with four types of beta-glucan or S. commune-derived-glucan dose-dependently. At 0 h and 24 h post-treatment, wound closure was captured using an Olympus IX70 microscope equipped with a digital camera at 40× magnification. The distance migrated was measured using the Image J software, and calculated by comparing the initial and final width of the scratch. HaCaT cells (7 × 104 cells/well) were seeded in the insert of a 12-well invasion assay kit (SPL Co.), and the bottom chamber was filled with media. The membrane allows the exchange of media during incubation. After 24 h, media containing S. commune-derived glucan was added to the insert and bottom for 24 h. Cells on the upper side of the insert were removed using a cotton swab, and cells on the lower side of the insert were fixed with 4% formaldehyde. After washing with PBS two times, invaded cells were stained with a 1% crystal violet solution and photographs were acquired at a 4× magnification using an Olympus IX70 microscope. Invasive ability was measured using the ImageJ program. HaCaT or fibroblast cells were seeded at a density of 1 × 105 each on 100 mm cell culture dishes and incubated for 24 h. These were treated with 20 μg/ml of S. commune-derived glucan in a time-dependent manner. Total protein was extracted from treated cells using RIPA buffer, and the protein concentration was determined using the BCA Protein Assay Kit. Equal amounts of protein (~ 20 μg/lane) were analyzed from each sample by resolving with 10% sodium dodecyl sulfate–polyacrylamide gel electrophoresis (SDS-PAGE). Protein loaded gels were transferred to NC membranes, and these were blocked in 5% skimmed milk with Tris-buffered saline Tween 20 (TBST) buffer, followed by overnight incubation with primary antibodies at 4 °C. Cytokeratin 10 (sc-53252), Cytokeratin 14 (sc-17104), FAK (sc-1688), p-FAK (sc-11765), C-Src (sc-130124), Integrin α3, α5, α6, αv, β1, β5, and GAPDH (sc-25778) antibodies were purchased from Santa Cruz Biotechnology (USA);S100A4 (ab27957) antibody was purchased from ABcam (UK); Slug (#9585), E-cadherin (#3195), and p-Src (#2101) antibodies were purchased from Cell Signaling Technology (USA). NOX4 (NB110-58849) and MMP-1 (#444209) antibodies were purchased from Novus Biologicals and Calbiochem, respectively. We used HRP-conjugated anti-mouse (K0211589, KOMABIOTECH), anti-rabbit (K021178, KOMABIOTECH), and anti-goat (AP1079P, Millipore) as secondary antibodies. Proteins were detected using chemiluminescent reagent, ECL solution (W6002, Biosesang). Six-week old male ICR mice (n = 6 for each group) were chosen for the experiment. All procedures were approved by the Animal Care and Use Committee at Jeju National University (permission number 2015-0033). First, the fur was removed with an electronic hair clipper and removal cream. Then, wounds were made on the middle of the back using a 6-mm biopsy punch. Wounds of mice in the experimental group were treated daily with 200 μl of beta-glucans (200 μg/ml) dissolved in butylene glycol for 2 weeks. Madecassol® was used as a positive control and applied to wound sites in the same manner as beta-glucans. Images were captured at 0, 3, 7, 14 days after wounding to evaluate wound closure and the rate was calculated as a relative percentage of the original wound area, using the ImageJ program. At 7 days post-wound, skin tissue was isolated and fixed using a 4% formaldehyde solution. Paraffin-embedded tissues were cut into 4-mm sections and stained using Hematoxylin–Eosin. GraphPad Prism 6 software was used for statistical analysis. Data are expressed as mean value with standard errors from three independent experiments. Significance between more than two groups was analyzed using one-way ANOVA, and the Student t test was assessed to compare two groups. A P value < 0.05 considered statistically significant. First, we prepared four kinds of beta-glucan solutions (pH 7.0) (Fig. 1). To analyze whether four types of beta-glucan, derived from S. commune, black yeast, barley, and euglena, affect the skin cell viability and migration, and have different properties, we treated HaCaT keratinocytes or dermal fibroblasts with various beta-glucan concentration (0–40 μg/ml). 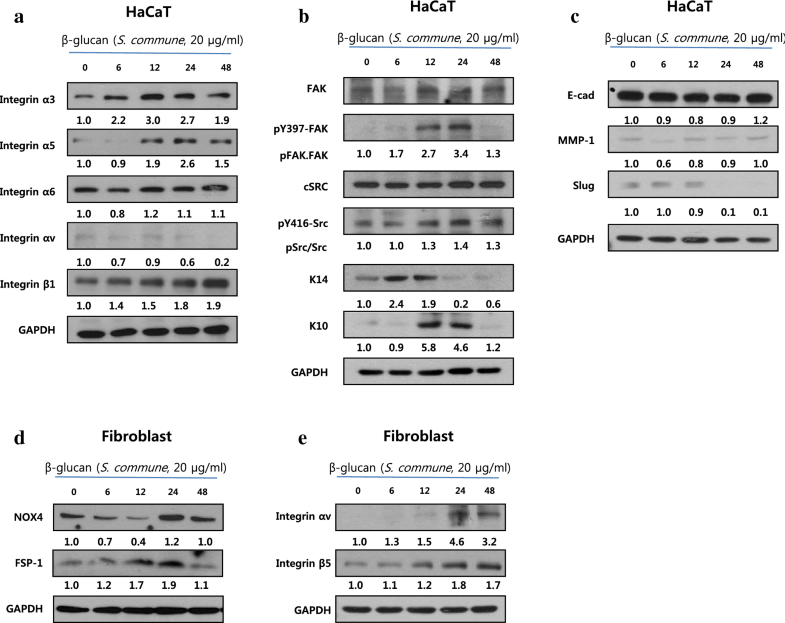 We found that all the beta-glucans display no toxicity for HaCaT and fibroblast cells using an MTT assay (Fig. 2a, c). But, migrations of HaCaT keratinocyte were increased upon stimulation with beta-glucans and peaked at 20 μg/ml for all the tested beta-glucans (Fig. 2b). 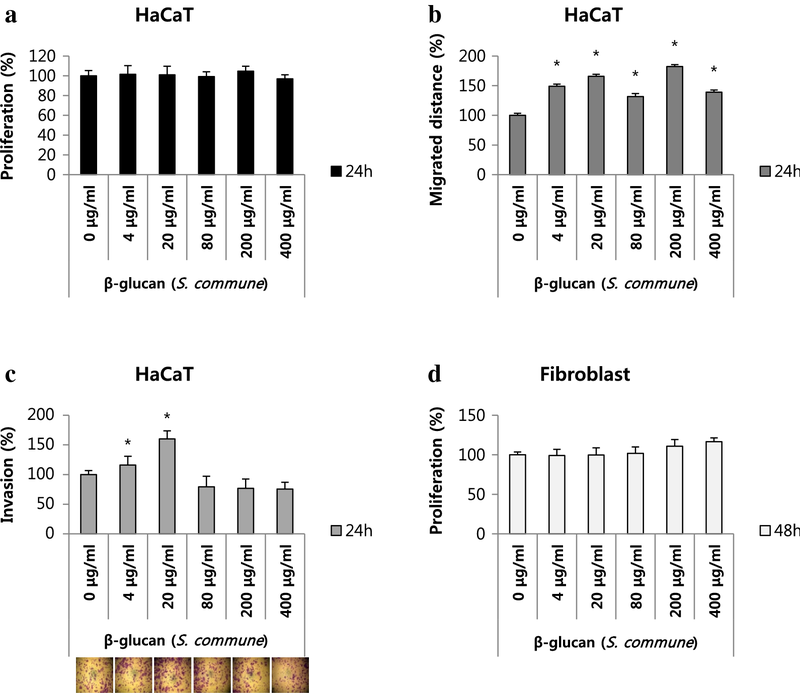 HaCaT cell lysates were treated with 20 μg/ml of beta-glucans to investigate the molecular mechanism of beta-glucan action. It was found that phosphorylation of FAK (Y397) and Slug expression sere significantly increased by S. commune-derived-beta-glucan (Fig. 2d). As the FAK signaling pathway and transition to mesenchymal cell are major factors of wound healing, these data indicate that the four types of beta-glucan have positive effects on wound repair. Especially, S. commune, beta-glucan is more effective than others. Based on the previous results, we selected the S. commune beta-glucan for further treatments. It displayed no cytotoxicity for the HaCaT and fibroblast cells (Fig. 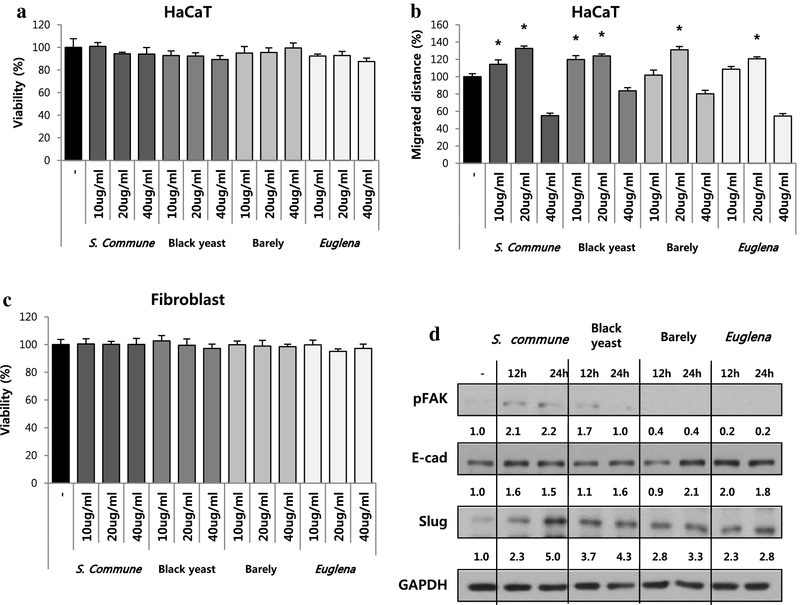 3a, d), but migration of HaCaT cells was significantly increased at 20 μg/ml treatments (Fig. 3b). Invasion ability of HaCaT cells was enhanced by beta-glucan (S. commune) and peaked at 20 μg/ml (Fig. 3c). Both the migration or invasion assays are important methods to detect whether beta-glucans have an effect on wound repair. However, it is known that these assays have different actions. Invasion assay includes protrusion formation and matrix degradation and it is analyzed by staining the cells penetrating through pores. Whereas, migration assay is the way to measure the distance over which the cells migrated. Therefore, we used 20 μg/ml of the S. commune beta-glucan for further experiments. Interestingly, the migration was decreased at 80 μg/ml and rebounded again at 200–400 μg/ml. Because the beta-glucan sample contains lots of factors that occur various biological reactions and we are not yet analyze and characterize the components of beta-glucan, we guess it came from complicated reaction (Fig. 3b). More research is needed. To investigate the migration mechanism of HaCaT cell treated with beta-glucan, we performed time-dependent treatments. Integrin is well known as a cell surface adhesion receptor, which acts upstream of the FAK/Src pathway. It has 24 subtypes which are formed by different combinations of one of the 18 α subunits and one of the 8 β subunits, which are non-covalently assembled together to form heterodimer . Integrin α3β1 mediates keratinocyte polarization during re-epithelialization and it is also known to control TGF-β related responses . Integrin α5β1 promotes keratinocyte migration  and αvβ1 integrins function to regulate keratinocyte adhesion during epithelial regeneration . We analyzed expression of integrin subunits in the beta-glucan treated HaCaT keratinocyte and found that integrin α3β1 and α5β1 were induced by the S. commune beta-glucan. However, the expressions of integrin α6 and αv were not affected by beta-glucan stimulation (Fig. 4a). Focal adhesion kinase (FAK) and steroid receptor coactivator (c-Src) mediate cytoskeletal dynamics and cell motility by controlling actin polymerization . Phosphorylated FAK at tyrosine 397 (Y397) recruit Src and activates it byphosphorylation at tyrosine 416 (Y416) . Upon the beta-glucan treatment, phosphorylation of FAK/Src was increased until 24 h expression of cytokeratin 14 was also peaked at 6 h and then decreased. Following the cytokeratin 14 down-regulation at 6 h, the intensity of cytokeratin 10 was significantly increased (Fig. 4b). Notably, the stratification in epidermis is a crucial factor of regeneration. When keratinocyte in the basal layer fully grow, they begin to differentiate rather than proliferation to spinouse, granular, and stratum layers . The expression of cytoketain 10 indicates differentiation and cytokeratin 14 is used for marking proliferation of the epithelium. Besides Integrin/FAK/Src, epithelial-mesenchymal transition (EMT) or matrix metalloproteinase (MMP) are known to be associated with cell migration . However, there are no detectable changes in these pathways such as down-regulation of E-cadherin and up-regulation of Slug or MMP-1 (Fig. 4c). These data indicate the improvement of keratinocyte stimulated by the S. commune beta-glucan through Integrin α3β1, α5β1/FAK/Src activation. ROS mainly function in a normal wound healing response, especially in dermal fibroblasts. Furthermore, NADPH oxidase (NOX) family is an important source of ROS generation . For example, Sampson et al. demonstrated the ROS signaling by NOX4, which induces fibroblast transformation of myofibroblast by increasing phosphorylation of JNK. NOX4 coordinated cytoskeletal remodeling and differentiation . The S. commune beta-glucan mostly promoted NOX4 synthesis at 24 h treatment (Fig. 4d). Integrins are also required for fibroblast infiltration into wound site. Integrin αvβ5, one of the integrin subunits, participates in fibroblast transformation to myofibroblast, which is marked with FSP-1, leading to dermal contraction. Upon a time-dependent treatment of fibroblasts with the S. commune, the expression of integrin αvβ5 was increased and peaked at 48 h (Fig. 4e). As a result, the S. commune beta-glucan accelerated dermal differentiation via integrin αvβ5 and ROS production. The fast wound closure occurs by epithelial regeneration following dermal remodeling. In an in vivo experiment, we made a wound using biopsy punch and measured the margin area at different time points. At day 3 after wounding, there is no significant difference between groups. However, the wound closure of S. commune-treated-group was accelerated in proliferative phase (Fig. 5a, b). Scab, formed during hemostasis, is a fibrin clot. As epithelial cell grows and migrates, scab loss occurs and it was used to compare the healing capacity . Except for the control and black yeast-treated groups, scab began to fall apart from wound at day 8 after wounding. Scab loss in the S. commune-treated-group was twice as much compared to other groups (Fig. 5c). After completion of wound healing, we stained using hematoxylin and eosin using isolated skin tissue. As shown in Fig. 5d, re-epithelialization is in progress under scars at day 7. The S. commune-treated-group showed elongated and thinly-formed epithelium compared to other groups. These results indicate that beta-glucan derived from S. commune has a beneficial wound healing effect. Our study demonstrates that beta-glucan from S. commune accelerates cutaneous wound healing. Beta-glucans have a common backbone, β-1,3-glucan, which is a key factor in determining their function. The length and number of branched chains is also important for specific binding to cells of the immune system . Beta-glucans are also known to promote resistance to viral, bacterial, and fungal diseases, as well as exhibit antitumor effects. In particular, beta-glucans derived from mushrooms have multiple short branches. Additionally, it is known that mushroom extract contains other effective ingredients of potential nutritional value (Fig. 1) . However, the wound healing effect of beta-glucans and their roles in repairing skin injury have not been comprehensively studied. Because of their wound healing properties, beta-glucan have been used in the development of bioartificial skin, considering their ability to bind to gelatin and collagen. It is known that wound dressing with beta-glucan enhance wound healing and reduce pain. Furthermore, beta-glucans increase proliferation, produce diverse cytokines, and release ROS in dermal fibroblast cells, leading to neutrophil infiltration and angiogenesis . Here, we found that S. commune beta-glucan promotes dermal contraction by inducing the expression of NOX4 (which contributes to ROS generation) and Integrin αvβ5 (Fig. 4). There are four different pattern recognition receptors (PRRs) for beta-glucans in immune system cells, complement receptor 3 (CR3), scavenger receptor, lactosylceramide, and dectin-1 . The dectin-1 beta-glucan receptor, has two isoforms the full-length isoform A and the stalk region-lacking isoform B. A previous study by Linda et al., showed that dectin-1 isoform B is expressed in HaCaT keratinocytes and possesses functions which are different from the ones observed in the immune system cells. These functions include promoting proliferation and migration, which are major processes during re-epithelialization . Spleen tyrosine kinase (Syk) is a mediator of dectin-1 activation and is phosphorylated by beta-glucans . Syk is phosphorylated by active Src, thereby induces cell spreading. On the contrary, active Syk promotes Integrin αV translocation to the membrane of epithelial cells and control migration through FAK and Src . As shown by these reports, several receptors can recognize beta-glucans epithelial cells, with beneficial effects for wound repair. We found that S. commune beta-glucan induces FAK/Src pathway activation via integrin up-regulation in HaCaT keratinocyte cells. In addition to the Integrin/FAK/Src pahtway, there are several indications of other action mechanisms by which S. commune beta-glucan may promote wound healing. One possibility is that dectin-1 and integrins stimulated by beta-glucans phosphorylate Src or Syk, forming a positive loop between them that can promotes cell migration. Further experiments are needed to prove this hypothesis. 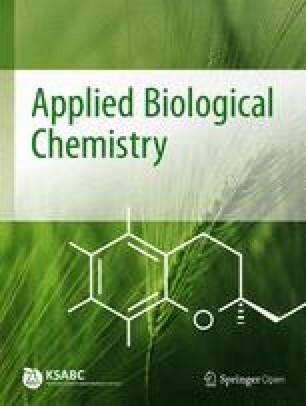 We demonstrated the cutaneous wound healing effects of four types of beta-glucans, and found that S. commune beta-glucan is especially efficacious in wound repair due to its ability to promote re-epithelialization and dermal contraction by activation of Integrin/FAK/Src in the epidermis as well as by dermal transformation via NOX4 expression and integrin up-regulation. These findings suggest that beta-glucan from S. commune is a potential therapeutic agent for skin injury. GS did most of experiments except animal tissue histology. CH did histology. SC prepare and supply beta-glucan. YMK and MC plan and supervise whole experiments and edit and correct writing. All authors read and approved the final manuscript. This work was supported by the Korea Industrial Complex Corporation through the Project Fostering the Industrial Cluster (No. RKK17008).